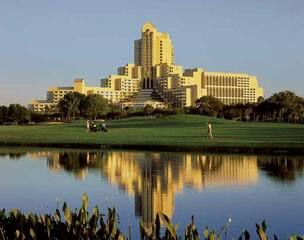 The Marriott Imperial Palms timeshare resort is located adjacent to the Marriott World Center resort hotel. We rode the free shuttle over to the hotel, and enjoyed some after-dinner drinks in the beautiful lobby, and the on the patio overlooking the huge pool. We also enjoyed lounging by the pool at the Royal Palms timeshare resort (adjacent to the Imperial Palms), where nice steel-drum music was playing. 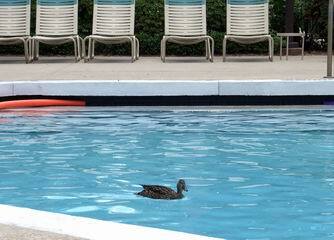 The water was almost too warm for us, but the local ducks seemed to like it. 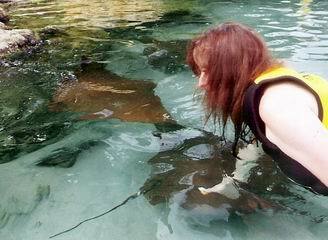 Our main activity for this trip was to visit Sea World's Discovery Cove theme park, which is a limited-admission, highly-interactive tropical adventure. 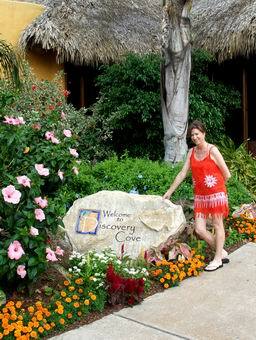 When you arrive at the entrance to Discovery Cove, you feel like you're entering a resort in the tropics, not a theme park in the middle of Florida. 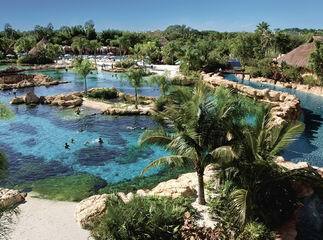 A day at Discovery Cove consists of swimming with dolphins, snorkeling with tropical fish, petting stingrays, feeding exotic birds, and floating down a jungle river. 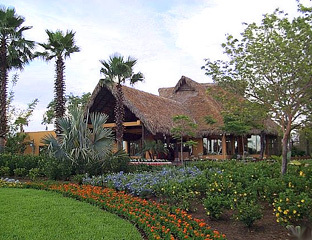 Despite all this activity, there are plenty of opportunites to enjoy the quiet and the beautiful landscaping. We first headed over to the Stingray Pool, which is a central-Florida version of the famous Stingray City on Grand Cayman Island. 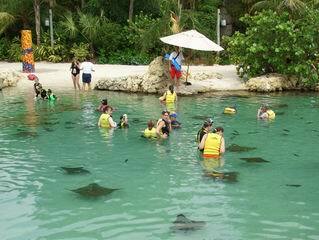 The rays tended to swim in a big circle, and we found an area against the rocks where they all came flying by. Please support this free website by visiting our advertisers, or by reading more here.